In this serialisation, we seek knowledge from the leaders of female idol groups. In the 4th of this series, we present Yajima Maimi from ℃-ute, who have entered their 10th year since their formation in June, and will be performing at the Nippon Budokan for the second time on the coming September 10th (Wed). ℃-ute has celebrated your 9th anniversary since your formation, but at which point in time did Maimi-san become the leader? I can't remember (laughs). About half a year after Arihara Kanna-chan joined, I was told that the leader should introduce her at the concert, and I have a recollection of thinking 'Eh? Me, the leader?'. At the time, I wasn't the oldest, and there wasn't a time when I had been called out to act as the leader. How did you handle it when you were given the leadership position? For example, were you happy, or was it something you didn't want? I couldn't think about anything at first. Whenever we have an announcement to make or a press interview, the leader has to be the first to speak, so I was nervous. But at other times, there wasn't really the sense of me being the leader in particular. When articles about ℃-ute appear in newspapers, 'Leader Yajima Maimi...' is often written, but I don't think there's anything beyond that. 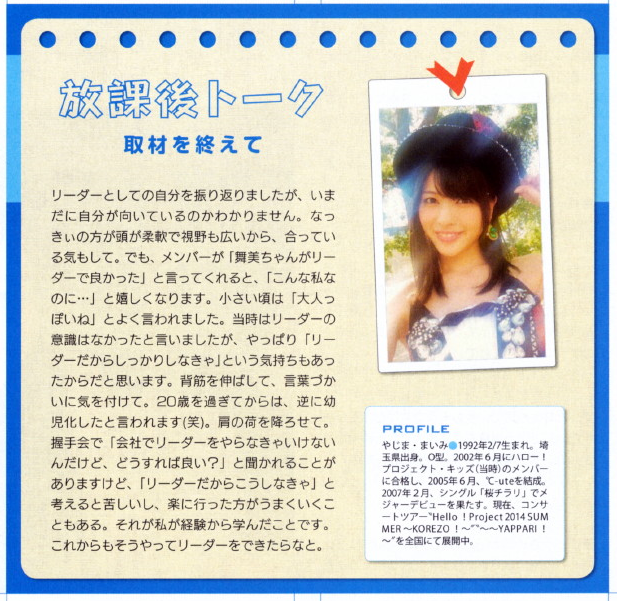 Talking about being spirited, Maimi-san is the youngest girl of 3 siblings, right? I had a spoiled upbringing at home. Both my brothers were always told by my parents to keep a careful eye on me, so I was well looked after. I was a crybaby during my kindergarten ages, and my brothers would occasionally come to have a look at me in the classroom, to check that I wasn't crying. I was a difficult child (laughs). Are you the type who wouldn't act as the class representative at school? I've done it before in primary school. I'm not the type of person who can lead people, but it seemed that I enjoyed standing in front of people, and I joined the soran bushi executive committee. The committee members would dance in front, so I announced my candidacy. In that sense, I feel like a long time ago, I was assertive. How about when you were playing with friends? What did you do when you took the initiative? Before I started working, I was that kind of person. I'd invite people, 'Let's go there!' But, once I started working, I ended up leaving it to others. Like how normally, when people start working, they can no longer be proactive? That's right (laughs). But for me, I didn't really take any action to stand out. Also, Maimi-san joined a boy's baseball team, right? Mixed in with the boys. I did, from my 1st until my 3rd year of primary school, then I switched to softball. Brimming with curiosity, I tried my hand at whatever I wanted to do. My brother was originally playing baseball, and we'd go and watch on holidays. I was really bored, so I felt like 'Then I'll do it too'. But all the boys around me were quiet. It seemed that my parents also thought that it didn't look like they were having fun, and told me that it might be better to stop. But I continued to insist that I wanted to do it. I'd hate to quit halfway through something I'd decided on. In my 4th year, I switched to girls' softball, then everyone was in harmony. Maimi-san, what position did you have? Did being a sportswoman help you out as a leader? It made my character open-hearted. This comes up when I'm dealing with girls in particular, but I dislike it when I hear people badmouthing others. I don't want to join in. Even if there's a girl who's troubled, I wouldn't go to the point of speaking ill about her. Because, you never know, you might be the one being badmouthed elsewhere. When I'm worried about someone, I'd bring them to a place where they can escape to. Such wonderful dedication. Back to the topic, you approach serving as the leader of ℃-ute in a positive way, don't you? I try to make it enjoyable, but when we became a 5-member group, I immediately thought that we were in a bad spot. I feel that it was from then that I knew about the many difficulties of being a leader. 4 years after your formation. But you were very aware of being the leader, weren't you? I thought that 'As I'm the leader, I should warn them,' but when I'd go 'Everyone, be quiet,' it was like I was nagging them. But, with the members' age, the fussier I got, the more irritated they seemed, it was like I was going around in circles. 'You're telling me not to do that, so what should I do?' I even worried about those kind of things. Maimi-san, I believe that you were 17 at the time. When we had 8 members, the 3 eldest were in the same academic year, and we'd advise the younger girls. We really were kids at the time, and there were girls who'd start fights, even at places where there were other artistes. The ones who would tell them off at those times would be the oneesan team. But 2 of them graduated, leaving me alone to caution them, and this overlapped with the members' rebellious phase. Even if I told them not to, they'd still make a racket in the dressing room and bother other people, and I had to tell them to 'Be quiet' so that ℃-ute's image wouldn't become worse, and when it came for us to appear, I had to say 'Let's all go,' even though it should be obvious. Did you have an outlet for your worries as a leader? Apparently, there was once that you told your manager-san 'I want to quit as leader'. There was. I was tired out after a Hello! Con rehearsal and my mother was picking me up, and the moment I stepped into the car, I just broke down in tears. My mother was surprised, asking 'What happened!?' Since I'm normally not the type to cry, and I keep my worries to myself. Everything just burst out in that moment. My mother was worried too, and having cried, I had to tell her everything. It felt like everything that was pent-up had burst out? Indeed, the leader of an idol group is the representative of the members, and is like the middle management between the staff above them. When I talked about that with my mother, she asked 'Have you tried discussing this with your manager?' And that's how it led to the story me wanting to quit as leader. I was told that I hadn't fully thought it through. 'There are staff-san around you, watching. If the responsibility becomes to much to bear, tell it to them. Please do not think that it's just you who's in the right'. And that lightened the emotional burden on me. Did your stance as leader also change? I stopped yelling. I would act level-headedly, and made myself an example. For example, when it's getting close to the time for us to head off, I'd start making preparations. When they noticed it, they'd think, 'Maimi-chan's started making preparations. We have to start too'. And then the group changed? It might just be that the members grew up too, but it ended up being that if we noticed anything about one another, we'd mention it. Now that everyone's more attentive, just as they've grown with age, they've slowly stopped thinking 'I don't need to say anything'. Well, for my personality, pushing ahead without holding anything back is impossible. I admired and wanted to become like Nakazawa Yuko-san, who speaks forcefully and tightens the group, but I knew that I wasn't that type of person. I thought that if I led by example, they'd understand. Okai Chisato-san once said that Maimi-san's style of leadership 'Feels like a goddess watching from above'. That isn't the case, and there are times when the members say that I'm nagging, so recently I say 'It's tiresome to talk too much about this and that. The way it currently is might be better'. I definitely think that saying too much isn't good. By the way, as part of your leadership duties, did the youngest, Hagiwara Mai-san, follow you at first? When Mai-chan was small, whenever we went to the countryside, she'd definitely have the same room as me, and our manager-san told me 'I'll let you take care of her'. Since I've always wanted a younger sister, I was happy. Although I was like a meddlesome older sister (laughs), going 'You can only do this much' or 'Let's get to bed', it was fun. Mai-chan would also come clinging to me with a 'Maimi-cha-n', we connected just like sisters. Mai-san was 9 when the group formed, but do you feel that you've watched her growth from zero? We always pampered her, and it's still the same, even now (laughs). But there was a time when she wanted to be independent. Looking back, she even had a rebellious phase. But she was cute, even when that happened. You were never at a loss with her? On the contrary, since we've been in this business since we were small, there are times when I feel that she's grown up. There are times nowadays when I think she's completely more reliable than myself. Saying things like, 'If we do this, then it'll turn out like that', she's the type of person who calmly thinks ahead. Even when ℃-ute received the Best New Artist Award at the Japan Record Award, even though everyone was crying and couldn't say anything, the youngest Mai-chan thought 'This'll look bad in front of camera', and she gave some comments. As well as being the leader, Maimi-san also stands at the front when it comes to performances. Lined up at the front row with you is Suzuki Airi-san, so what are your thoughts about her? Airi is truly skilful at whatever she does, and what's more, it's doubly-strong with the hard work she puts in. Whereas I'm the clumsy type, so she gives me a lot of motivation. Since for something that makes me think, 'Even though I want to do it like that, I can't', Airi can immediately pull it off. And I think that's something the other members feel too. She's like that when it comes to music too. If she thinks something sounds off, she adjust her pitch accordingly, and if even a single note is missed, she'll notice and say that something's lacking. If a music professional were to see her, I think they'd immediately understand Airi's genius. 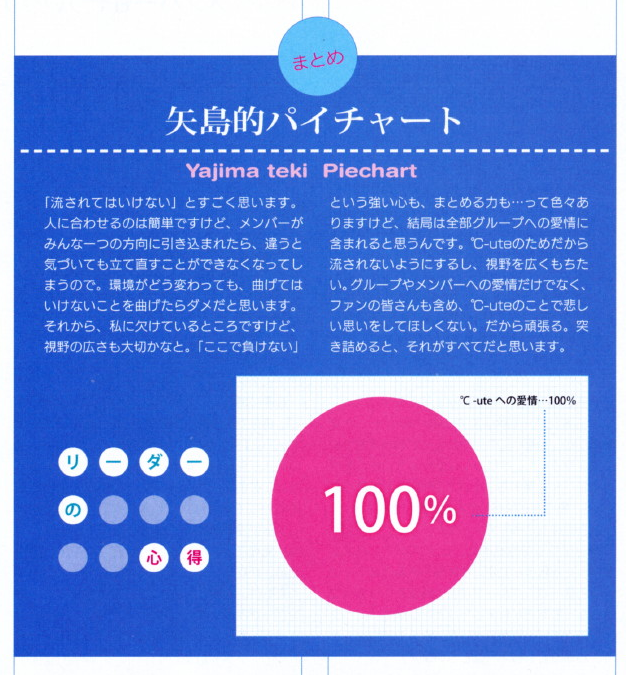 This is an interesting story from a while back, but there was some event where we had to listen to ℃-ute songs played at 5 times normal speed and name them, but I had no idea since they sounded completely different. But Airi was the only one who was able to get it, and I think that was amazing. Honestly, I think she's unmatchable. But, I wonder if it the members improved just because we'd be left behind if we didn't keep up with her? We had to work harder, it was something that fueled us. 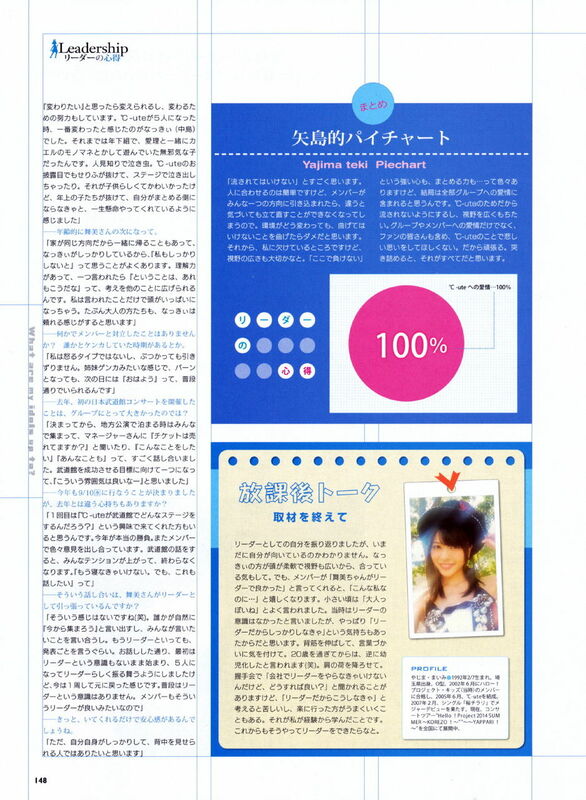 So ℃-ute's performances, said to be the greatest in the idol world, are a result of trying to catch up to Airi-san. How compatible are you usually? Both Airi and I spend our time in the same way. Quietly, leisurely, we go at our own pace, we love eating (laughs), we're really on the same wavelength. When it's just the two of us at work, we get up to all sorts of weird things. When all of ℃-ute are around, there are other funny members, but when it's just the 2 of us, we'd get wrecked (laughs). Has there been any aspect of her that changed from when she was small? She says so herself, but it seems that she's become able to look at those around her and pin down what part of them is strong-willed. There are times when she can also feel when people are restraining themselves. As a leader, how do you see Okai Chisato-san? She's the life of the party. She's been that way from the past. She enjoys talking in front of people, and she's someone who pump ℃-ute up. It feels like Chisato-san has a lot of friends in the industry. She's someone you can dote on. Even in the Kids, the senpai doted on her, calling her 'Okai-chan'. Perhaps from the grown-ups' point of view, she looked like a puppy (laughs). She's friendly, and always smiling. She has lots of friends, and she can get along with anyone. At things like handshake events, she creates an atmosphere that makes it easier for fans who've come for the first time to talk. I think she's also got something about her that brings peace of mind to those around her. Do the 2 of you hang out? Talking about recently, we went to have a look at a clothing exhibition together. Quite a while back, I got invited to watch the horror movie 'Paranormal Activity'. Scary stuff is a no-go for the other members, but she said 'If it's Maimi-chan, you'll come, right? ', I was scared too, but I still went in the end (laughs). When the 2 of us stay overnight somewhere for work, we talk until late at night, and she asks me, 'I'm scared, so is it okay if I stay in Maimi-chan's room?' (laughs). Nakajima Saki-san, she's the one who's changed the most, right? That's right. It's her strong will, probably. She changed since she herself thought that she wanted to change, and she put in great efforts to make it happen. When ℃-ute became a 5-person group, Nacky (Nakajima) was the one I felt changed the most. She'd been in the lower age group up until then, an innocent girl who would play around, doing things like frog impressions together with Airi. A shy crybaby. She missed some lines when ℃-ute was announced, and cried on stage. That was childish and cute, but when she was no longer one of the younger kids, she had to pull herself together, and I feel that she did it with everything she had. Age-wise, she would be next after Maimi-san. Our homes are in the same direction, so there were also times when we'd go back home together, and since Nacky's become reliable, I often think that I have to be reliable too. Her comprehensive faculty, and when she's told something, 'That said, this has to be like that too', her thoughts expand to other things. For me, just what I'm told already fills up my mind. I think that the grown-ups too might feel like they can rely on Nacky. Were there any things where you clashed with the members? A period when you fought with someone, for example. I'm not the type that gets mad, and I don't get dragged into conflicts. We'd have sisterly fights, and even if it goes to 'bam', the next day we'd go 'Good morning', and continue on normally. You held your first Nippon Budokan concert last year, what was the biggest thing for the group? Since the decision was made, all of us gathered for when the regional performances were being decided, we asked the manager 'Are the tickets selling well? ', and we really discussed things like 'We want to do this', 'That too'. I thought that this sort of atmosphere was nice, where all of us had the unified goal of making the Budokan a success. It's been decided that you'll be performing there again on the 10th of September (Wed), does it feel different from last year? Those discussions, are they led by Maimi-san as the leader? Doesn't feel like it (laughs). When someone just spontaneously goes 'Let's gather up now', everyone has a heated discussion, saying what they want to say. Even if I'm said to be a leader, it's roughly to make announcements. When we're talking, I'm not aware of being the leader when we start, but when it's the 5 of us, I behave as the leader, but now it feels like we've gone full circle. Normally I'm not concious of being the leader. Although the members seem fine with that sort of leader. I'm sure that just having you around brings them a sense of relief. However, I'd like to be a person who's level headed herself, a person who can be an example. I really think that you can't just go with the flow. It's simple to bring people along, but if you draw the members together in one direction and then realise that a mistake was made, you can't correct the course. No matter how the circumstances change, I don't think you should give in at times when you shouldn't give in. And also, though this is something I lack, having a wide perspective is important. With a strong heart thinking 'I won't lose here', and the strength to bring them together... there are all sorts of things, but in the end I think it all boils down to one's love towards the group. Because, for ℃-ute's sake, I'd like to not go with the flow, and have a wide perspective. Not just love towards the group and the members, but including the fans, I don't want them to have sad memories of ℃-ute. So I do my best. In essence, I think that's everything. When I was small, I was often told that I seemed grown-up. At that time, I said that I didn't have any awareness of being a leader, but there were also feelings that I had to become reliable since I was leader. I straightened my back, and was careful with how I used words. Ever since I went past twenty, I've been told that I've turned childish instead (laughs). The weight was removed from my shoulders. At handshakes and such, I'm asked, 'I have to act as a leader at my company, but what should I do? ', but it's difficult to think like 'You have to do this because you're a leader', and you can do it easily if you're comfortable. That's what I've learnt from my experience. I'd like be a leader who does things in such a way in the future.